The National Science Foundation today named Kristina Olson, University of Washington associate professor of psychology, winner of this year's Alan T. Waterman Award. The Waterman Award is the U.S. government's highest honor for an early career scientist or engineer, recognizing an outstanding scientist under the age of 40 or within 10 years of receiving a Ph.D.
As part of the honor, Olson receives a five-year, $1 million research grant. 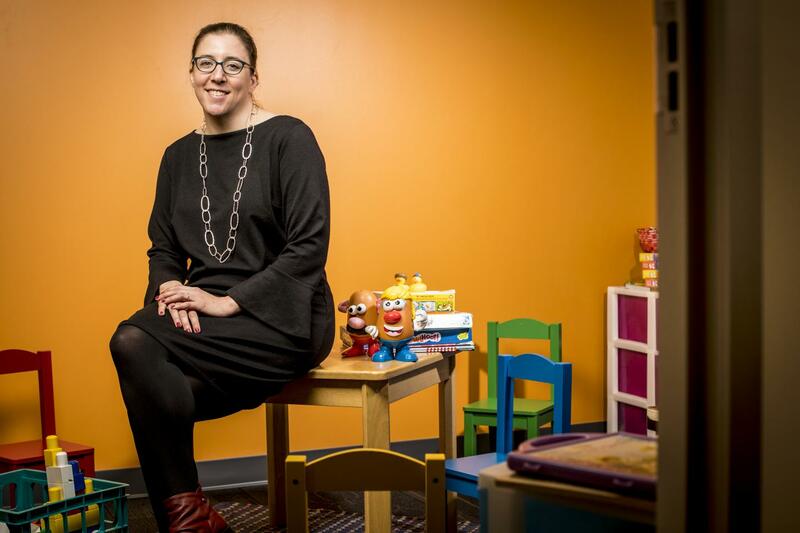 Olson, who runs the Social Cognitive Development Lab at the UW, created the TransYouth Project, which is the nation's largest longitudinal study of transgender children, an effort for which she is renowned. She is the first UW faculty member to receive the Waterman Award in its 43-year history. She is also the first psychologist to receive the award and the first woman to receive it since 2004. "Winning this award was a true shock as I was unaware I'd even been nominated. I am truly humbled and honored to have even been nominated. More than anything, this award is a reflection of the hard work, dedication and brilliance of the staff, students and collaborators with whom I work. Only through their contributions am I even in consideration for this award," Olson said. According to the NSF, Olson is being recognized for "innovative contributions to understanding children's attitudes toward and identification with social groups, early prosocial behavior, the development of notions of fairness, morality and inequality, and the emergence of social biases." Cheryl Kaiser, chair of the UW Department of Psychology, said Olson's work "breaks tremendous new ground." Examining how children view inequality, for example, can ultimately impact how they address such issues as adults. "Our childhood ideas about fairness can shape how we as adults understand injustice and whether we maintain or challenge inequity in society," Kaiser said. "Kristina's work is profound, and has implications for how children develop to become change-makers in the world." The Waterman Award will help maintain and expand the study, Olson said. The research team is now recruiting children who identify as gender nonconforming – those who haven't socially transitioned, as the current transgender participants have. Eventually, the study will include teenagers who are in the process of transitioning, she said, as well as intersex children. Olson said the award also will support another of her goals: establishing a mentorship program aimed to include underrepresented undergraduate students interested in her and related labs' research at UW: LGBTQ students, students of color, first-generation college students, and those from small colleges with fewer resources for research. Olson grew up in a diverse college town – something she said made her keenly aware of differences in experience even as a child. She noticed who was treated differently, the groups that formed and the prejudices, and understandings, that revealed themselves over time. She remembers more than one gay classmate who fled an unwelcoming home, friends' parents who expressed overt racial discrimination and the accepting teachers who provided support and celebrated student's unique backgrounds. Questions about how people relate to each other, and how their ideas and issues manifest in society, drove Olson's initial career choice as a clinical psychologist. She didn't think of research itself as a professional path; her only image of academic research was being alone in a lab hunched over chemicals, plants or soil. "I was 100 percent certain I was not going to be an academic. To me, that was being alone in a lab! I wanted to work on teams and understand the struggles people had in the world." Olson laughs. But as she pursued her bachelor's degree in psychology at Washington University in St. Louis, she realized that she could devote herself to studying what she was passionate about – the sources of conflict, how people see one another and how those ideas form early in life. She went on to earn her master's degree and her doctorate in social psychology from Harvard University and her first faculty appointment at Yale University. Olson has written about the encounter that led her to start the TransYouth Project: an invitation 10 years ago to a friend's house for dinner, where she met her friend's young son before this child transitioned to live as a girl. As she later delved into issues of gender identity, she found a "gaping hole" in research about such children. "The questions I'm interested in have to do with the categories kids see themselves in, how children see themselves and the world. "Transgender children" is a category we have so little scientific knowledge about," Olson said. "I'm interested in their experience of feeling you are in a social category that other people don't think you're a part of." What she's found, so far, is that children in her study – children who have socially transitioned to the gender they identify with – firmly embrace their gender, just as children who identify as the gender they were born with. In addition, the first results from the TransYouth Project showed in 2016 that transgender participants had normal rates of depressive symptoms, and only slightly higher rates of anxiety, than members of the control group. People sometimes misunderstand the project, Olson said: No one is performing surgery on these young prepubescent children, for example. Also, she's not the one instructing parents whether to support their children through a social transition. These children transitioned socially well before she met them, meaning they identify as a gender different from the one they were born with, perhaps with a new name, clothing, toys, activities and friends. The study started small, but over time, as Olson traveled to interview families and word spread, interest grew. Participants come from cities like Seattle, where gender identity is a relatively familiar topic, to rural communities where transgender children are sometimes isolated or ostracized. The UW, the College of Arts & Sciences and the Department of Psychology helped fund Olson's initial work, Kaiser said, recognizing the value in supporting early career faculty. Olson's scholarship exemplifies Psychology's vision of promoting healthy minds and society through psychological science, she said. Olson's research, in those early years, was a "striking act of bravery," Kaiser added. "It was unusual; it was different. She could have focused exclusively on her research on fairness and prosocial behavior and would have been incredibly productive and continued to be amazing," she said. "But this was a project Kristina felt was critical for society to understand. This risk paid off as her trailblazing scholarship now has breadth and impact that is remarkable for a scholar at her career stage. She represents the very best of psychological science." Olson may be reached through the UW News office.